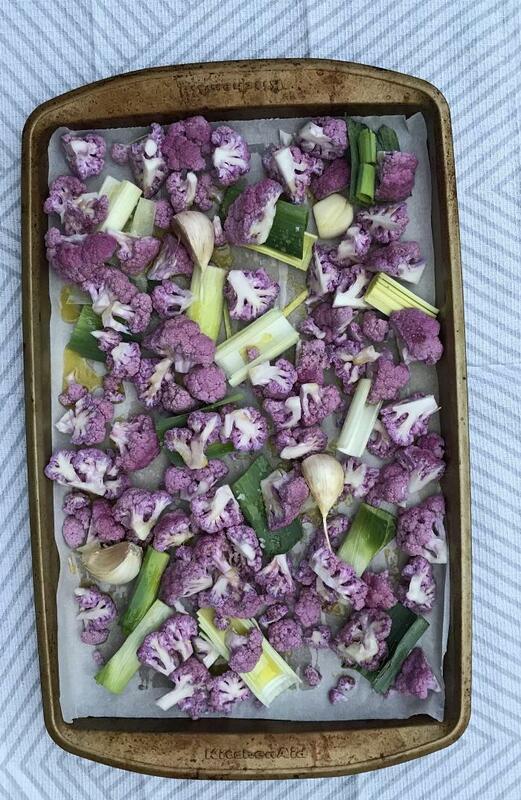 4Wash and divide the cauliflower into florets. 5Put cauliflower and leeks onto the large rimmed baking sheet, drizzle olive oil and sprinkle with salt and freshly ground pepper, if using. 6Toss everything together with your hands and spread out evenly into a single layer. 7Bake in preheated oven for 10 minutes, remove from oven to flip the pieces over and return to bake for another 10-15 minutes or until everything looks browned and the leeks are crispy (not burnt). 8Let cool slightly and transfer to a serving platter or directly to your mouth.